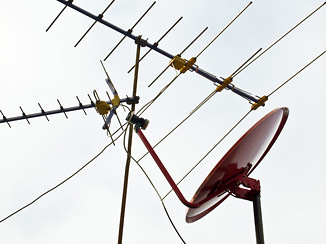 DO I NEED PLANNING PERMISSION FOR A SATELLITE, TV OR RADIO ANTENNA? Do I need Planning Permission for a Satellite,TV or Radio Antenna? Before purchasing an antenna or having an engineer come install one on your property, it is important to know whether you need planning permission, listed building consent, or permission from the landlord or owner. You are responsible for placing antennas in the appropriate position. Under the Town and Country Planning (General Permitted Development) Order 1995, you have a general permission to install antennas up to a specific size on property without the need to apply for planning permission. This general permission depends on your house type and area. Any work which does not meet all these requirements will require planning permission. an antenna is not installed on a chimney, wall, or a roof slope which faces onto, and is visible from, a road or a Broads waterway. aan antenna is not installed on a chimney, wall, or a roof slope which faces onto, and is visible from, a road or a Broads waterway. If you live in a flat, the above limits refer to the building as a whole and not to each separate flat. Before buying or renting a radio antenna, satellite, or TV antenna it is important that you check whether you will require planning permission to erect the items or not. Do I need planning permission for a satellite, TV or radio antenna is not just a question you should ask yourself, it is something that you need to do some research on. Make sure before erecting any of these items that you check to see if you require consent from your listing agent or the landlord or owner of your piece of property. It is up to you to ensure that the antenna that you will be placing on your home is set up in an appropriate manner. For homes and other buildings that are up to fifteen metres high, you will not need to obtain satellite, TV and radio antenna planning permission. As long as the additional device is installed properly, according to building regulations you will not need to get any additional permissions. If the building that you reside in is in a designated area, you will not need to receive satellite, TV and radio antenna planning permission either. Of course, just like with other types of buildings that are not in designated areas, it is up to you to ensure that the building regulations for setting up one of these devices is adhered to.